George Soulé is an American singer, songwriter and musician. George Soulé was born in Meridian, Mississippi in 1945. In the early 60s he worked as a radio DJ whilst performing in R&B bands and developing as a songwriter, and by 1966 had signed a publishing contract with Acuff-Rose Music in Nashville. He released a few singles as a solo artist on the La Louisanne and Tamm labels, and even made a TV appearence performing on Shindig, but his recording career never took off. By the late 60s he had settled into a behind-the-scenes career, finding work as a songwriter, producer, backing singer, demo singer and drummer, working at both Rick Hall's Fame Studios and the neighboring Muscle Shoals Sound Studio. He had another shot at a solo career in the early 70s, first with his own brilliant "So Glad You Happened To Me", which came out in 1972 on Bell Records but went nowhere. He then had a surprise Top 40 R&B hit with his version of George Jackson's "Get Involved" in 1973 - the recording was originally just a demo intended for another artist, but Rick Hall liked it so much he saw that it was released with Soulé's vocals. With its lyrical message and Soulé's delivery, no doubt most listeners assumed the singer was black, so it caused something of a sensation when he was asked to appear on the Soul Train TV show and turned out to be white. Despite this his solo career still didn't take off, and by the late 70s he had left music as a full time occupation behind. This compilation was released in 2011 on Soulscape Records (after he had finally released a solo album in 2006). It consists of twenty-six recordings from his time at Muscle Shoals Sound Studio, so presumeably all from the early 70s. Most of them are demos, though it does also feature his own single "So Glad You Happened To Me". They are all great songs, and his voice is truly fantastic, making this an excellent album of laid-back blue-eyed soul. Many of these demos were recorded by other singers in the 70s, including Percy Sledge, Delaney Bramlett, Mavis Staples, Dee Dee Warwick, Brook Benton and Esther Phillips. The most-covered song here is "You Can't Stop A Man In Love", which was done by Bobby Womack, Carl Carlton, Reuben Howell, Jimmy Elledge, The Supremes, The Temptations and Dobie Gray. Note - this compilation does not include "Get Involved" (go find it on youtube if you haven't heard it!). Very nice site! 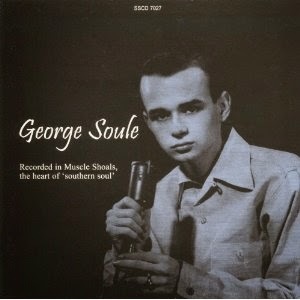 George Soule is a great writer and singer!